However, the battery holder I used is a very simple, clever and brilliant connection that Hannah Perner-Wilson shared on her web site. My adaptation was to use Bare Conductive Electric Paint to "glue" the conductive thread onto the copper tape. I used surface mount LEDs onto which I soldered tube crimps (the kind used in jewelry making). I then used conductive thread to loop through the tubes, being very mindful to keep all the positive sides on one thread and all the negative ones on the other. It was helpful that the LEDs I used had a little notch on its negative side. I also made sure that the positive side thread was longer at the end (the part coming out of the paper) to cue me, just like a bulb LED's positive "leg" is longer. The basic procedure is: make LED and thread circuit; pull a sheet of paper; lay down thread circuit, making sure threads do not cross or touch each other; pull another sheet of paper and lay on top to sandwich the circuit; let dry on glass or non-porous surface. Learning from my mistakes, I placed beads on the threads before attaching the clothespin battery holder to act as insulators. I didn't do that with the following sheet of paper and I had to be very careful not to have the threads touch each other thereby creating a short circuit. I could say I didn't feel like soldering those |)4^^|V crimp tubes on those |=V(|<ing tiny SM LEDs again, even though it's the truth. Instead, I'll say I wanted to try another design feature by using bulb type LEDs, which is also the truth but makes me seem more adventurous rather than lazy. The procedure was basically the same except that for the LED and thread circuit path, I bent and coiled the legs of the LEDs and the thread was wrapped around these coils. When the second sheet was put on top, I used my fingers to poke the bulbs through and then sort of patted the pulp around it. I didn't even try to make it smooth for reasons mostly centering around the fact that I did not have any pharmaceuticals around when I would most assuredly go over the compulsive smoothing-out ledge. However, my official reason is "to incorporate texture as a design element". 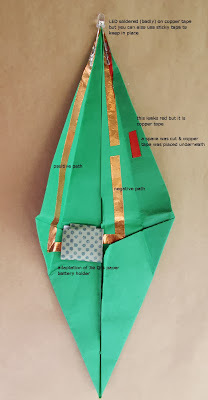 I wanted to see if I could use the copper tape paper circuit technique with an origami structure. I wanted to do a dragon but the patterns I found had too many fold and I couldn't figure out how to add the copper tape, LEDs and battery (damn that battery!). Even with the tulip structure I found, it took me a while to figure out how to make it work. I'm not saying it's difficult, just not so easy for me (and once you see it, you'll wonder what my problem was, but let's not judge). The patten is from the book "The Origami Handbook" by Rick Beech and was designed by Kunihiko Kasahara. I think origami structures have a lot of potential with the copper tape paper circuit technique. Although, for me, the key seems to be structures without too many folds or, at least, the path for the circuit can't have many folds. My hero, Jie Qi, has done some work using origami structures and flexinol wire. Check out her impressive flexinol wire paper circuit origami crane. I dare you to tell me you don't want to do the same thing even if you don't know WTF is going on. If you have any questions about my projects, please don't hesitate to ask me either in the comment section or using the "Send me an email!" widget that Blogger has very usefully supplied.